Now that the days are getting shorter and the air is getting crisper it's become that perfect time of year for that tummy-warming, feel-good feeling, the one and only soup! So, if you love snuggling up with a bowl as much as we do and are curious to try out a few new recipes then keep on reading because after trying out various different amazing concoctions we are proud to present you with 10 of our recent favourites. 1. Creamy Broccoli Rabe Soup w./ Crispy Quinoa this yummy soup is made by Lindsey who runs the blog Dolly and Oatmeal. We are big fans of broccoli as it is and love the fact that she adds crispy quinoa for a bit of a extra texture. 3. Speaking of exotic twists, this Spicy Chipotle Carrot Soup has just the right amount of spice. We absolutely love making this recipe from Modern Granola since the chipotle peppers warm us up and make this carrot soup tastes so, so good! 4. The next soup is one for all you cheese lovers out there. This Sweet Pea and Parmesan creation we found on Fluxi on Tour is absolutely amazing! The fact that it's oh so creamy and has just the right amount of cheese is bound to make you swoon. 5. Along the same lines of creamy deliciousness, this Cauliflower and Cashew Cream soup it is beautifully rich and makes for a perfect use of a generally mundane vegetable like the cauliflower. You can get the full recipe for over on Olives For Dinner. But be warned, you'll want to eat the whole pot in one sitting! 6. Another favourite of ours is The Bon Gourmet's Creamy Thai Zucchini and Corn Soup. Both ingredients make an amazing combo and are made even better by the introduction of thai basil and cilantro/coriander. So, if you are looking to spruce up your classic zucchini soup, this recipe is definitely the way to go! 7. "An apple a day keeps the doctor away" who hasn't heard that saying? But did you know that apple makes a perfect ingredient for a warm winter soup? Don't believe us? Then head over to Foodess and see for yourself how yummy this Apple Parsnip Soup looks (and tastes). 8. 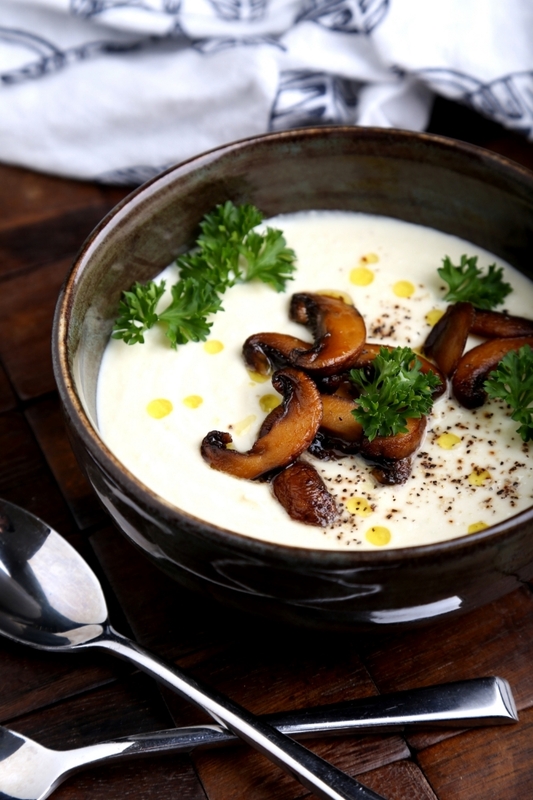 Season With Spice is the site where we found an amazing recipe for Homemade Mushroom Soup. It tastes, if possible, even better than it looks. We can't wait to make this recipe again soon! 10. Last, but certainly not least is this unique twist to a classic Tomato Soup from Love & Lemons. By combining tomato, chickpeas and coconut milk they have managed to create a version of this classic that we have never tried before. Brought to you by the guys and gals who make natural, healthy, handmade, ice lollies using real fruit that are lactose, gluten and dairy free. Keep posted for more blogs and let us know if there is anything you would like us to write about!